Reveal purrfect skin with the Cat Animal Mask from Skin79. Ideal for those with troubled skin, the face mask is designed to target bacteria that can lead to breakouts, resulting in soothed and clear skin. Fortified with Aloe Vera and Tea Tree oil, the vitamin rich sheet mask delivers hydration to skin whilst combating bacteria that is trapped inside pores. 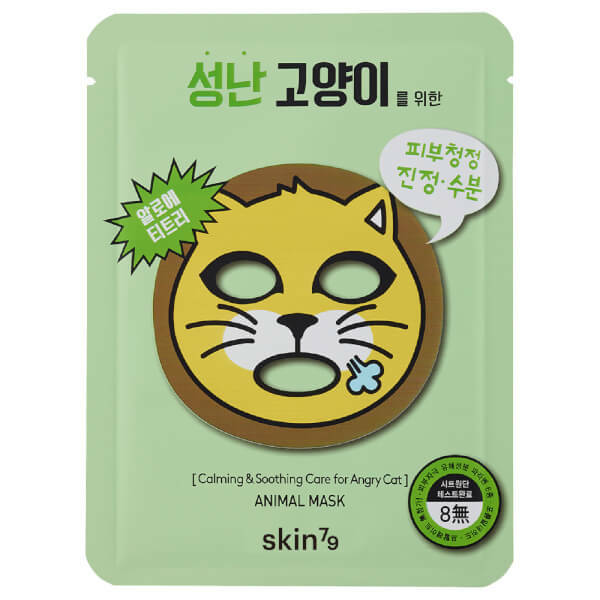 The playful cat mask provides skin with a nutrient boost, leaving the complexion calm and cared for. Apply to face after cleansing and toning the skin. Leave in place for 15 to 20 minutes. Dab remaining essence into skin. Water, Butylene Glycol, Glycerin, Aloe Barbadensis Leaf Extract, Melaleuca Alternifolia (Tea Tree) Leaf Extract, Vitis Vinifera (Grape) Seed Extract, Nelumbo Nucifera Seed Extract, Simmondsia Chinensis (Jojoba) Seed Extract, Trehalose, Betaine, Alantoin, Carthamus Tinctorius (Safflower) Flower Extract, Phenoxyethanol, Xanthan Gum, PEG-60 Hydrogenated Castor Oil, Tromethamine, Acrylates/C10-30 Alkyl Acrylate Crosspolymer, Ethylhexylglycerin, Disodium EDTA, Fragrance, 1,2-Hexanediol.